Since the FCC voted to gut net neutrality last December, a variety of corporations and prominent tech companies were swift to denounce the repeal. 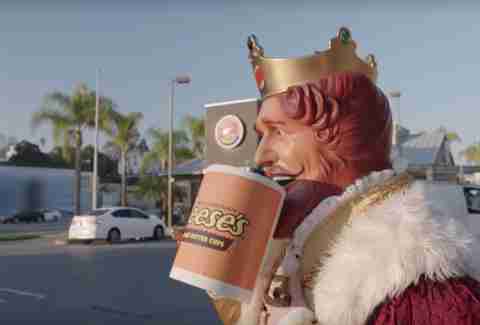 But only one of the dissenting voices is known for serving flame-broiled goodness: Burger King on Wednesday released a surprisingly informed PSA about the consequences of living in a post-net neutrality world -- one in which ISPs can throttle access to the internet based on what consumers can afford. So what did we learn through this commercial? People hate having net neutrality revoked, especially when the concept is distilled through the ever-relatable cheeseburger. Using the Whopper as a metaphor for internet "fast lanes," which ISPs could theoretically use to speed up access for a higher price, the chain managed to infuriate a bunch of hungry customers. By imposing a steep tariff and wait times for the sandwich, customers became well-acquainted with the FCC's widely unpopular measure. The verdict: people grow furious when something they're used to consuming for a low price suddenly inflates. In one clip, a cashier explains to a perplexed customer that Burger King "can sell more and make more money selling chicken sandwiches and chicken fries, so now they’re slowing down the access to the Whopper.” (Hah!) In another, the store manager holds a Whopper outside of a bag, counting down the literal seconds until the burger's wait time is up. It's truly the most dystopian Burger King ever. Afterward, all the unwitting victims, who Burger King claims were "actual guests," had their minds changed about net neutrality. According to various surveys, a majority of Americans favor the overhauled internet protections, and Senate Democrats are trying to their best to repeal the much-maligned measure. So far, they're only one Republican colleague away from receiving the 51-vote majority needed to do so. To that, we'll drink from an oversized Reese's mug.